When Darius Jones tells the story of his first time working in a garden, his eyes light up. Four neatly tilled rows stretched out over the length of the two-acre urban farm he was working on, he says, each a hundred feet long. The instructions were straightforward: Plant one head of lettuce every foot. Make a hole, put the lettuce in the hole, close the hole back up. Don’t forget to gently loosen up the block of soil so that the roots can expand. He planted four hundred heads of iceberg lettuce that day. It was meditative work for an eighteen-year-old, remembers Jones, now twenty-four. “I just put the lettuce in the ground and thought about life,” he said on a sunny Wednesday last October, standing next to a plot on Legends Farm at the intersection of 45th and Federal Streets in Bronzeville. Windy City Harvest, the Chicago Botanic Garden’s urban agriculture initiative, operates the two-acre farm in cooperation with the two development firms.It also runs an on-site incubator for budding urban farmers to help get their businesses of the ground. Here Jones managed a plot for two years, growing leafy greens to sell at the Pilsen Community Market through his business, Urban Aggies, new at the time. Since last winter, however, he has been in charge of the rooftop garden at McCormick Place, another Windy City location, helping to harvest over four tons of vegetables for use in the convention center’s restaurants. But for Jones, gardening is much more than a livelihood—it represents his freedom. That’s because the two-acre lot where Jones first learned how to farm was in the Cook County Jail, set behind a double chain-link fence topped with razor wire. “I got sent to jail for aggravated vehicular hijacking, by the graces of the universe,” Jones likes to say. He was arrested in early 2009, when he was seventeen. At that point, he recalls, he could have been booked for doing much worse. He grew up in East Garfield Park, moving often between relatives’ homes. He was small for his age, picked on by the kids who lived around him. When he moved in with his aunt in a different part of the neighborhood, he took the opportunity to completely change his persona—to shift his paradigm. Jones says he learned about the concept of the paradigm shift a year ago, when he read The 7 Habits of Highly Effective People, Stephen Covey’s self-help mega-phenomenon. To shift your paradigm, Covey writes, is to change a fundamental character trait to alter how the world sees you—and how you see yourself. Jones says he’s undergone two paradigm shifts; moving in with his aunt was his first. In this new environment, Jones says, “to sink was to be a good kid and go to school”—to “swim” was to adopt a whole new attitude. He began to hang out with the kids who used to pick on him. They played basketball and went to school, but they also biked around the neighborhood with BB guns, robbing local dealers as they went. In eighth grade he was expelled from his charter school for shooting another student in the eye with a BB gun. He was arrested and sent to juvenile detention. His relationships with family members started to deteriorate after that. Jones fell in with a gang and learned how to steal cars, which he would hotwire and leave in abandoned lots. He held up local drug dealers at gunpoint, only to give the drugs to his friends. The gang members nicknamed him Swindle, and he earned a place in their inner circle. In jail, Jones remained affiliated with his gang, and spent time in solitary confinement for those connections. But when Jones wasn’t in solitary confinement he spent most of his time reading, preferring long series like Harry Potter and Alex Cross novels. Fourteen months into his sentence Jones received a new public defender, who brought him back to court and convinced a judge to lessen Jones’s sentence, pending his completion of the Vocational Rehabilitation Impact Center program. Also known as Boot Camp, the program is a rigorous, military-style program aimed at teaching structure, discipline, and job skills to nonviolent offenders. After a few weeks, Jones was placed on the gardening shift. He couldn’t have been more excited: over the course of his year-and-a-half in prison, he had been outside exactly twice. After finishing Boot Camp in July 2010, he was released on probation and joined the Windy City job training program, sleeping through his classes by day and hanging out with his friends in Garfield Park at night. One day, a woman came up to the stand and asked Jones about the bitter melon they were selling. He didn’t know what she was talking about. Jones started opening up more and talking with the people who bought the produce he was selling. Over the next two seasons, he helped as Windy City quadrupled their sales at the market. The program was growing, adding new sites, and, by 2013, moving over 30,000 pounds of produce each year. The year before, Windy City had received a grant from the U.S. Department of Agriculture to support six beginning farmers through incubator programs over the course of three years. Jones was picked to be one of the first participants. At twenty years old, Jones began receiving attention from local media. WGN reported on Urban Aggies, his budding business, and WBEZ named him one of their “EcoHeroes” of 2013. At the end of the 2014 season, Jones was asked to manage Windy City’s rooftop garden at McCormick Place, and in early 2015 he was hired to run Garfield Produce, a hydroponics farm housed in a warehouse across the street from George Westinghouse College Prep. He’s currently the general manager, but will be making the transition to CEO early this summer. 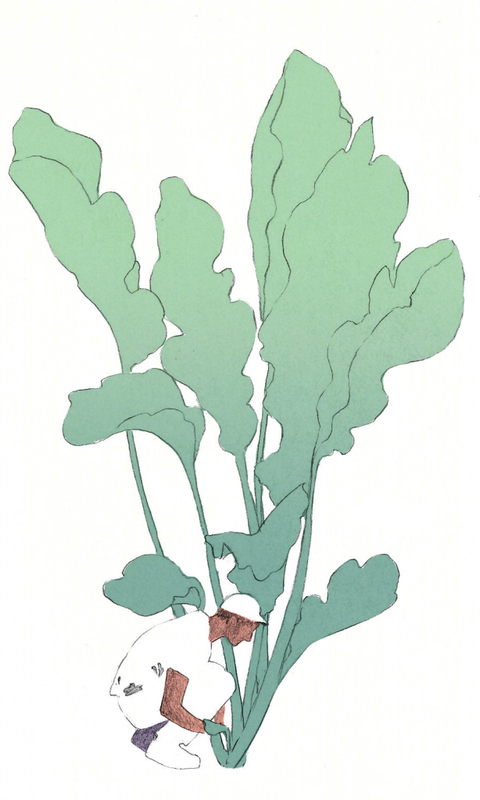 Jones and his growing assistant produce about thirty pounds of greens each week to send off to restaurants like the Haywood Tavern, The Berghoff, and Hyde Park’s Yusho and A10. Giving a tour of the warehouse recently, he marveled at his life’s trajectory. I heard you speak at the Cook County Forest Preserve Board meeting in November, Darius. You are truly inspirational and I wish you great success in your new position as CEO. Important story, well told! Thank you! !